Cassius Clark is one of the breakthrough stars in the IBG-PASS Pro Stock Series right now. Yet many people don’t know the low key driver very well. It seems that more people are confused about his surname than anything else. Casual fans often mistake Clark for being a sibling of defending PASS champion Johnny Clark. They are both young, talented and from Maine. They are even very close friends off the track, but they are not related. Unfortunately, Billy Clark didn’t get to enjoy the kind of career longevity that some of his peers, such as Bobby Dragon, Dale Shaw and Kelly Moore, did. An accident off the track pretty much ended his tenure as a driver. But Billy Clark stayed involved in racing behind the scenes as his son followed in his footsteps as a ski racer. This created a situation to get Cassius Clark behind the wheel. Unfortunately, Clark picked a bad race to make his PASS debut at. Over 50 cars were entered for the 36 car field at Oxford. Clark came up two positions short of gaining a starting spot. But he’s been in every PASS event since. In fact, the PASS car is one of only two different race machines that Clark has wheeled in his career. A Legends car was a good start for Clark. After the 2001 season, Clark though about moving up into a full-sized car. The then 20-year-old driver and his family weighted their options and ended up getting help to go a level higher than they had even hoped. And things have turned around. 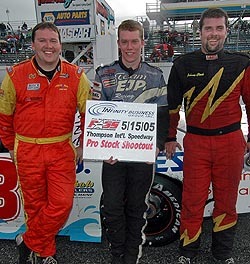 At the end of last season, Clark won a non-points PASS race at Quebec’s Autodrome Montmagny. He started out 2005 with a third-place run at White Mountain Motorsports Park (NH) and backed that up with a victory at Thompson two weeks ago. But that doesn’t mean that the 23-year-old is the only member of his family who knows his way around a racetrack. 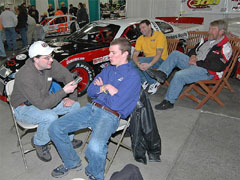 15 years ago, his father Billy, was one of the first stars of a then young NASCAR Busch North Series. The elder Clark only won two Busch North races, but finished within the top five of the series point standings four times in the five year span of 1987 to 1991. More notable is the fact that when the Busch North record book is opened, the very first race winner in the series' history was Billy Clark. The road that he took to get started in racing was a lot wilder back in those days than it is now. In Pro Stocks, Clark has been known as one of the hardest luck drivers in PASS over the last few years. In 2003’s $100,000 to-win Big Dawg Invitational, he was a contender before losing a wheel just past halfway. Last season at Thompson, he was looking like he would run away and possibly lap the field when an oil line fitting came loose. More oil line problems and a wreck cost him a shot at victory in the second Thompson race of 2004. Clark didn’t let the bad luck get him down. Even when he is not racing, Clark is still at the track as much as possible. 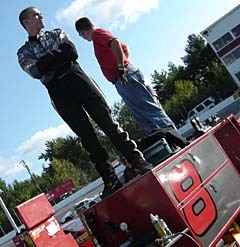 This past winter, he went down to Speedfest at USA International Speedway (FL) and served as Ben Rowe’s spotter. While down there, he picked up a few thoughts on special events where Super Late Model and Pro Stock teams from PASS, the CRA Super Series, USRA and Sunbelt Series could all get together and compete. “I think now with the bodies we are pretty close. Everyone pretty much runs the same shocks and a frame is a frame. The biggest difference is probably with the motors. But now, the way that everyone is talking, I think that we might have the same horsepower up here that they have down there. Clark isn’t far from his roots these days. 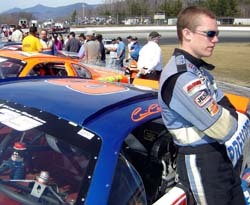 His father is still a key part to his racing program. And while Billy Clark turns plenty of wrenches, he doesn’t get too involved with telling his son how to drive. Surprisingly though, Billy Clark has never practice or tested his son’s #8 car.